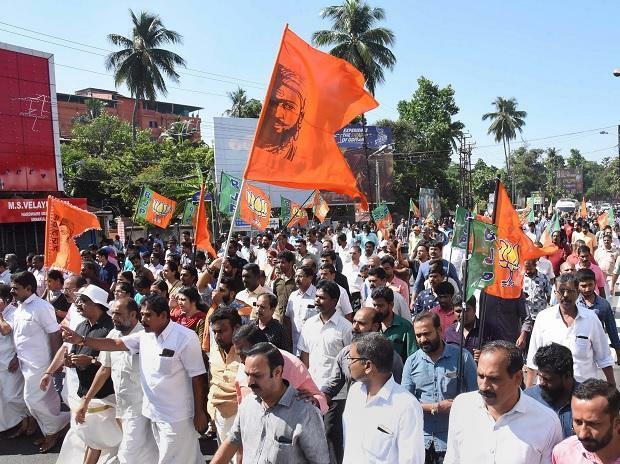 Violence involving BJP-RSS and ruling CPI(M) workers over the Sabarimala issue continued in Kerala late Saturday night and spilled over into the early hours of Sunday with a number of houses and shops in the politically volatile Kannur district being attacked. Police said bombs were hurled early Sunday morning on the house of a non-gazetted officers (NGO) Union leader at Thalassery in Kannur. The houses of certain BJP workers have also been attacked in the area forcing the district administration to impose prohibitory orders. In a peace meeting called by the district administration Saturday, BJP and CPI(M) leaders agreed not to take out any protest march in the area. According to state Director General of Police Loknath Behara, 1,286 cases have been registered till Saturday night and 3,282 persons arrested in connection with the violent incidents in the state since the January 3 hartal called against the entry of two women into the Sabarimala temple. Of the arrested, 487 have been remanded, 2,795 granted bail. In Kannur district, 169 cases have been registered and 230 persons arrested, while in Palakkad 166 cases have been registered and 298 people arrested. Kerala has been on boil since January 2 afternoon following the visit of two women of menstrual age in to the Sabarimala under police protection. Right-wing groups have been staging widespread protest across the state against the state government's decision to implement the Supreme Court order of September 28 allowing women of all age groups in to the hill-top shrine. Prohibitory orders are in place at various areas across the state following violent clashes between the BJP, CPI(M) and the police.